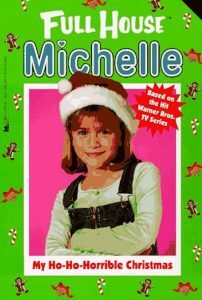 My Ho-Ho-Horrible Christmas was published in 1997 and features either Mary Kate or Ashley in a Santa hat and overalls on the cover. 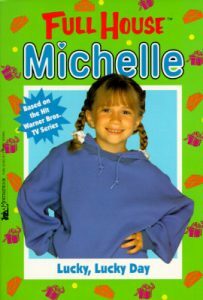 I can only hope whichever twin wasn’t on the cover got to be the Michelle they used on the Full House, Michelle book, Lucky, Lucky Day, which was also in my attic. Yep. It’s another first edition. Renoir, meet Monet! Published by Parachute Press, I had to look long and hard to find the name of the author because apparently Pauline Preiss wasn’t in it for the glory that comes from writing a children’s book “based on the hit Warner Bros. TV series”. That Pauline Preiss is humble to a fault. 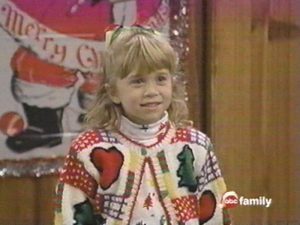 The story centers around nine-year-old Michelle Tanner. Most of the gang is there–Danny, D.J., and Stephanie Tanner, Joey Gladstone, Uncle Jesse, Aunt Becky, and twins, Nicky and Alex. Even Comet the dog is mentioned. 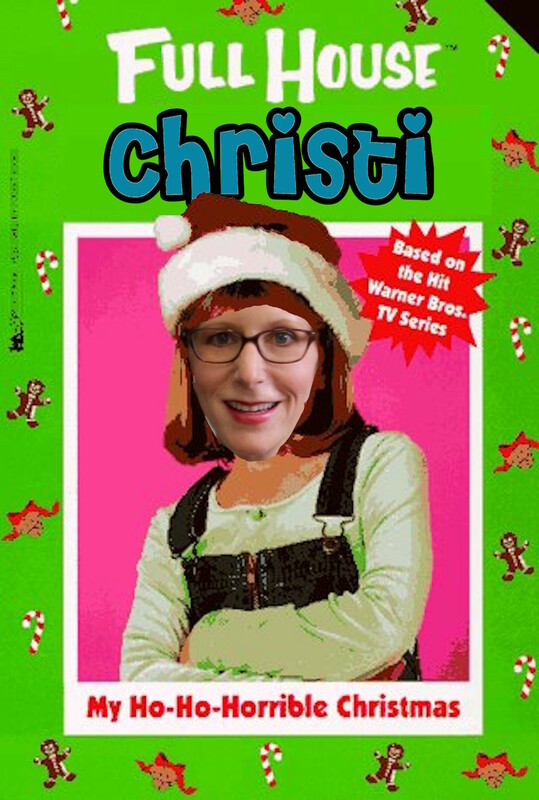 If the book has a major shortcoming, it is the noticeable absence of Kimmy Gibbler. But I will overlook that because it was action packed. Michelle and her sisters were on Christmas vacation when their dad, Danny, announced he had a super duper surprise. The doorbell rang, and… SURPRISE! 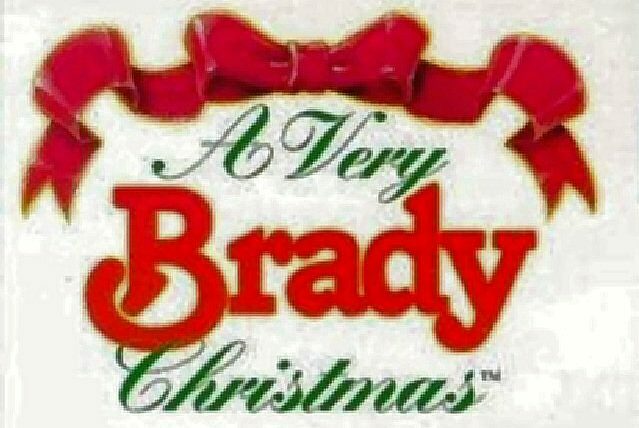 It was the girls’ seven-year-old cousin, Marshall. 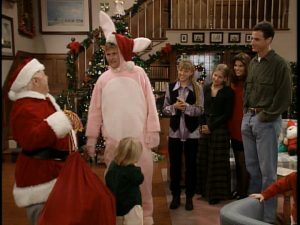 Marshall was there to spend Christmas vacation at the aptly named Full House while his parents were off galavanting who knows where. Michelle was surprised, but she didn’t think it was super or duper. She thought it was… Wait for it… Ho-ho-horrible! Marshall was a bug lover. That’s right. He loved bugs. He also loved following Michelle’s every move. And he was a klutz–frequently spilling things. Still, for all of his faults, Marshall was a likable guy. Except to Michelle. She didn’t like him. Honestly, her intense avoidance of her sweet, bug-loving, younger cousin added an extra degree of depth to the character of Michelle. Danny signed Marshall up for the same Christmas day camp Michelle was set to attend because Danny did not understand that a fourth grader needs her space. At the camp, Marshall was a pest in the worst degree. He followed Michelle everywhere. He spilled paint on her way cute Christmasy outfit. And, when Michelle and her friend, whose name escapes me, made a new friend, whose name was Alta, buggy Marshall was buggier than usual. Michelle and whatsherface were thrilled to be invited to popular Alta’s Christmas party, until Danny insisted that Michelle needed to ask Alta if Marshall could attend, too. Um, manners, Danny! Maybe Alta could only invite a certain number of kids. Anyway, Alta said, “No way, Jose,” except maybe not in so many words. Michelle tried to find something else for Marshall to do so she could attend the party solo. She tried to get him cooking with Danny. She tried to get him telling jokes with funnyman, Joey Gladstone. She tried to get him an invitation to watch Nicky and Alex in their preschool Christmas production. Everything blew up in her face. That’s when Michelle blew up at Cousin Marshall! She made a list of rules for the kindhearted Marshall to follow. I don’t want to give it away, but Michelle was a bit of a meanie pants. Marshall tried to follow the rules, which meant he couldn’t talk about bugs, spill anything, or follow Michelle too closely. At the day camp, Alta began to treat Marshall like her servant, while Michelle watched it all happen. Eventually, though, Michelle did stand up for Cousin Marshall. That’s when Michelle and her friend, whatshername, said they wouldn’t be caught dead at Alta’s party. BURN! Michelle ended up throwing her own party and it was slammin’! There was a piñata and everything. They ate the Christmas cookies Marshall made that looked like bugs. The bug cookies went great with eggnog, which I found to a bit of a stretch because nothing goes great with eggnog. Hot chocolate? Sure. Eggnog. Blech. As you can see, there were some holes to this storyline. All in all, though, it was an enjoyable holiday read. 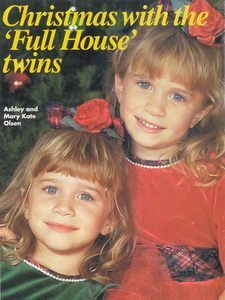 I suggest you catch up on all of the Full House series of books before they come out with a Fuller House series. I only hope that master storyteller, Pauline Preiss, is still available.